Whether you have lots of experience creating videos, or you’re a video newbie, you owe it to yourself to get started using Facebook Live. It’s a fun, easy way to leverage the power of video to convey information, stories, and emotions. There is nothing like the power of live, interactive video to grow your audience, connect better with your followers and deepen relationships with your customers. 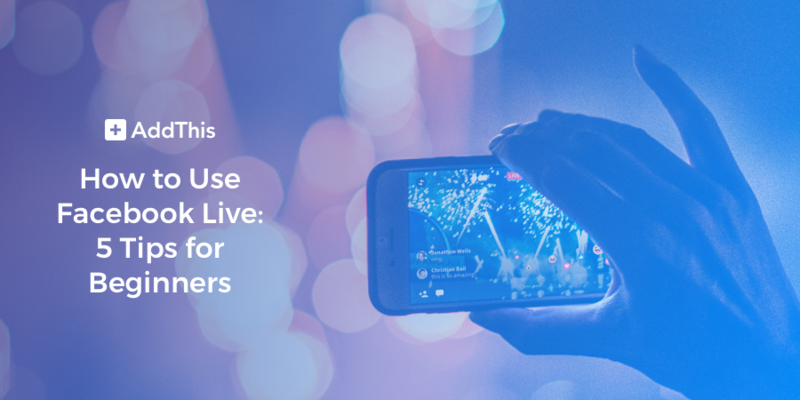 If you’ve never tried Facebook Live before, it’s easy to broadcast your first live video from your mobile device (using Facebook’s iPhone or Android app) or from a PC (using the Chrome browser and a connected video camera). For step-by-step instructions on how to actually start a Facebook Live video, check out these links: iPhone, iPad, Android, PC. It may take some trial and error to master this highly visual and interactive channel, but we hope the following beginner tips will get you started on the right foot. Write up a script outline. We’re not talking about writing every word you’ll be saying—you definitely don’t want to read from a script. But, you do need to know what topics you’ll be covering and what you’ll be showing on screen. Having a basic structure (think, “talking points”) will make it easier for you to flow once the broadcast is streaming. Select an appropriate location. Select a well-lit environment where external sounds will not interfere with your audience’s ability to hear you. Try avoiding places where you might be interrupted, or where background action might distract viewers from focusing. Test your connection. An unstable internet connection will spoil the best-planned broadcast. Make sure your device is getting a good WiFi or cellular data signal before beginning. Test your video and audio equipment. No matter what device you’re using, be sure everything is working before you start broadcasting. The video should be clear. If appropriate, use a tripod to avoid a shaky image. Ensure the microphone is well-placed to capture your voice clearly. Facebook Live lets you run in private mode so you can see and hear exactly what your video will look like before others see it. Until you are experienced and confident in every aspect of your live broadcasts, you should do a practice run (or two!) before broadcasting live. One good reason to do a practice run before going live is so you feel comfortable with what you will say, do and show. Having a colleague observing will make the practice run feel more real, and he or she also can provide observations and tips to help you do better when you’re broadcasting live. Another important reason to do a practice run is to make sure that the production quality is up to your expectations. There’s no better way to test that your equipment is working properly, the image quality is good, the sound is clear and your data connection is working well. After each practice run, watch the recorded video and make any needed tweaks before going live. Unlike your more polished marketing materials, your Facebook Live broadcasts can be more natural and relaxed. It’s not about achieving perfection; it’s about keeping it real. In other words, your goals are to leverage your personality, showcase what’s special about your brand and your company’s culture and to connect with your audience on a more human level. Stay away from anything that feels like advertising! And again, don’t read from a script. When you’re on camera, try to relax. Pretend you’re hanging out with friends. Smile. When you are comfortable and relaxed, it is easier for your viewers to connect with you, person to person instead of person to company. Be yourself. Speak in a conversational tone, and use the kind of vernacular you wouldn’t typically include in your more formal marketing communications. Go behind the scenes. Talk about yourself and your teammates—it’s okay to get a bit personal. When you keep it real, your audience will feel much more comfortable engaging with you, and spreading the word to others. The first thing to do is write a short, compelling title and an appealing description of your upcoming Facebook Live broadcast. Your title and description can help get viewers to tune in. Leading up to the scheduled broadcast day, begin promoting it via your other channels. If possible, create a short “teaser” video—or even an image—that hints at some of the interesting content you’ll be broadcasting. Including this in your posts will make them more eye-catching and engaging. Use Facebook Live to target your personal network, the fans of your business page and any relevant Facebook groups. If you have a budget for advertising, and the broadcast is important enough, consider running paid Facebook ads touting your upcoming broadcast. And, of course, let your followers know about the upcoming broadcast by posting reminders to your newsfeed. Also, don’t forget to promote your video beyond Facebook: send an email to your mailing list and post teasers to your other social media channels as well, such as Twitter, Snapchat, Instagram and your own blog. Reminder emails and posts about half an hour before the broadcast is scheduled to begin will be effective at bumping up your viewership counts. Facebook reports many different metrics for each video you post. These include Unique Viewers, Minutes Viewed, Video Average Watch Time and a Video Retention graph. For Facebook Live videos, there also is the Peak Live Viewers metric, which indicates the highest number of concurrent viewers at any one time, and Viewers During Live Broadcast, a visual representation of the number of viewers watching during each moment of the live broadcast. Additionally, Facebook provides a number of Audience and Engagement metrics, including People Reached, Post Engagement, Top Audience and Top Location. By carefully examining these metrics, you will gain a good understanding of how well your video performed and how much it helped you achieve your goals. With this insight, especially across a series of Facebook Live videos, you can determine the aspects of your videos that are working well and those aspects needing improvement. Beyond the numbers, how did viewers respond? What kind of comments did you receive? What kind of conversations were started between you and your audience as a result of a video? Facebook Live videos provide an endless number of ways to experiment. Try different types of topics, settings, styles, numbers of people on camera, days of the week, times of day and so on. Over time, you will discover what works best for you and your audience. Track your performance, experiment with different approaches and keep it fresh, getting better and better over time. Looking to grow your Facebook presence? Get more people talking about your content with the Facebook Like Button and get more shares with the Facebook Share Button. Get started today!